You can read about the company’s efforts on their website, Arctic Home. 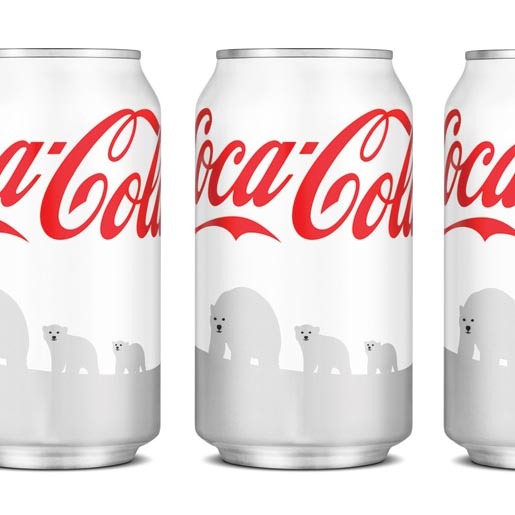 The fact sheet outlines Coca Cola’s marketing efforts, but this article in Time Magazine published last year explains the devastating effects of global warming on polar bears and the plan to create a refuge where the ice will remain longest, also called the Last Ice area. 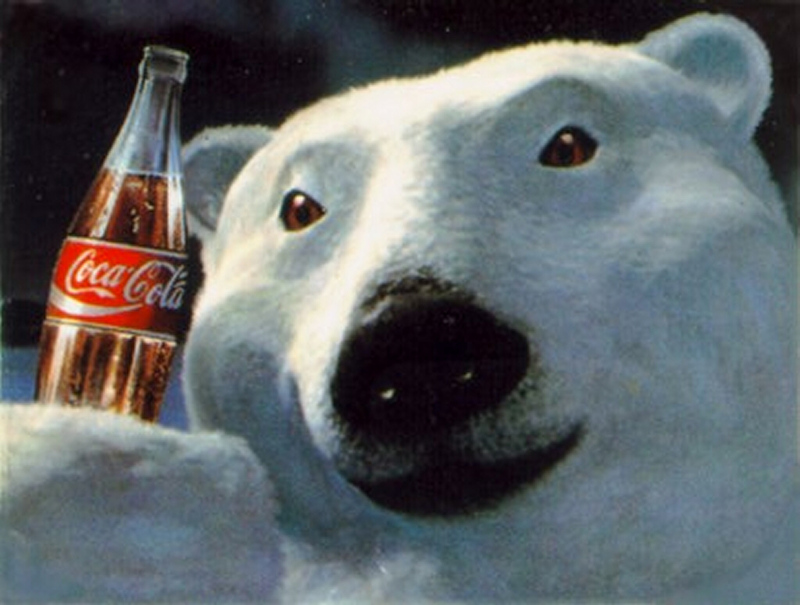 Polar Bears have been part of Coca Cola advertising since 1922. Last April, Meryl Streep narrated the IMAX movie To the Arctic 3D, sponsored in part by the Arctic Home initiative. Ironically, while Coca Cola has created livepositively.com, a program devoted to recycling, healthy living, and protection of our environment, critics emphasize that the products they create (specifically sugary beverages) contribute to a world health crisis and obesity. I know that no one wants to dwell the negatives during the holidays, but famous advertising man Alex Bogusky with the advocacy group, The Center for Science in the Public Interest, released a video in October that satirizes our love of sugary beverages and the devastating effects of the resulting health impact using a story of polar bears who drink too much soda. Check out the article in USA Today, which includes the video. Yesterday, Jeremy and I were involved in yet another one of our annual work events. When the stress level is high, it’s quite possible that one or the other of us will call for emergency supplies–a Diet Coke. 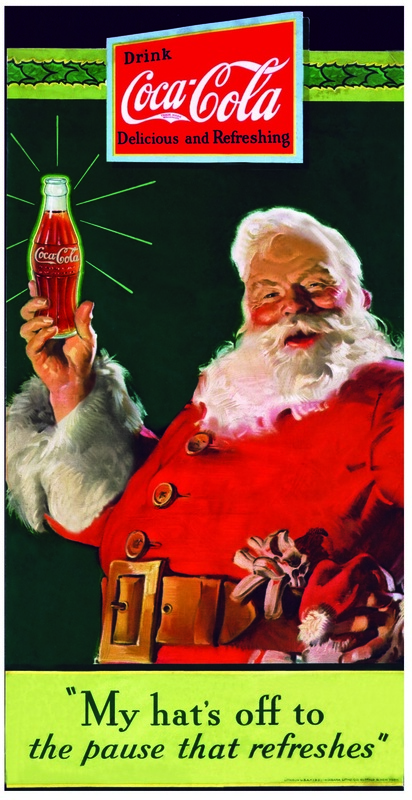 That made me think of the annual Coca Cola Christmas campaigns which began over 80 years ago and helped to shape our popular image of Santa Claus. After reading the corporate history of the Coca Cola campaigns, I learned they began in 1922 with the slogan “Thirst Knows No Season.” This is because most people associated Coca Cola as a thirst-quenching warm weather beverage. 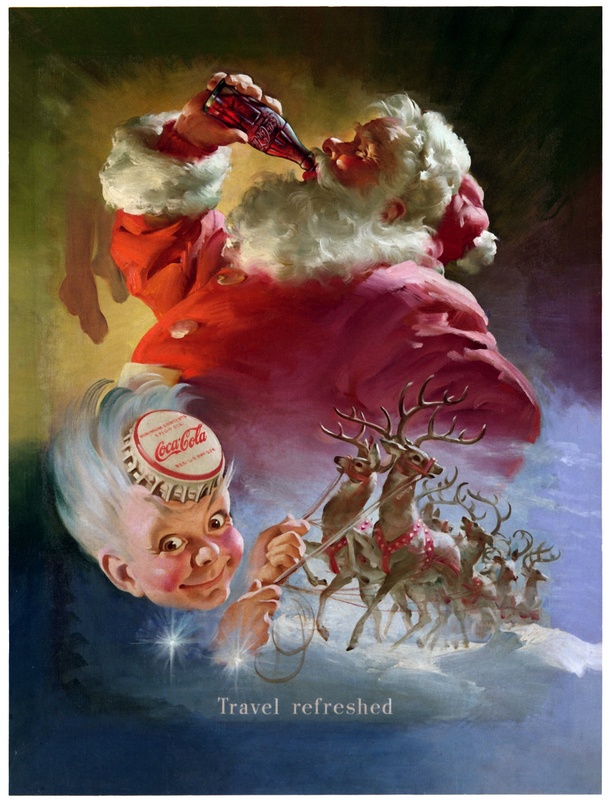 In 1931, Coca Cola commissioned Michigan-born illustrator Haddon Sundblom to develop advertising images of Santa Claus. He based his illustrations on details in the “Twas a Night Before Christmas” story. 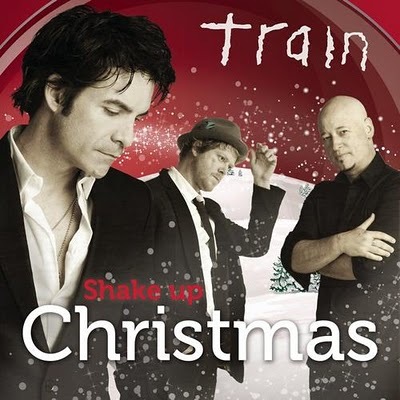 As I was thinking about Coca Cola, I decided to look at their most recent Christmas Campaign 2011 using a song “Shake up Christmas,” first recorded by Train in 2010 and then by Natasha Bedingfield for Coca Cola’s 2011 Christmas ads. How did I miss this song? How did I miss the videos? I like the Train video better than the 2011 campaign, but the theme is the same. Santa shakes a snow globe and the world inside the snow globe comes alive with Christmas miracles. It doesn’t cause tears like the Hallmark campaign, but it does warm the heart. Which version of the song do you like better? More about Coca Cola in future posts. I attended a tech conference in Baltimore for two days, and my mind is on overload from what I have been learning. During the event, I had a long discussion with a friend who is in the market for a smart phone. As I chattered on incessantly about my love of the iPhone, it occurred to me that I haven’t checked out any Christmas apps! This is an embarrassing oversight. I’m hard at work researching tonight. Grinchmas Cards: Top on the recommendations list rated by CNN, Babble.com, CNET, Appmodo and more is the Dr. Suess Camera by Oceanhouse Media. It earns 4.5 stars out of 5 and costs $1.99. Users can make “Grinchmas Cards. 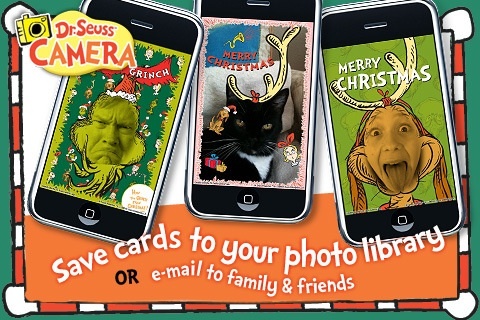 The app provides 20 backgrounds based on original Dr. Suess artwork, and the cards can be emailed or printed. I’ll be looking into this more thoroughly this week and I’ll be posting the results on the blog. Coca-Cola Snow Globe: This app allows you to load faces into an interactive snow globe and email the cards to friends. Like JibJab, the figures dance, but the user “choreographs” the dance. This app is free, and it’s another personalized and quirky way to send Christmas greetings. Like Grinchmas cards, your kids will have fun spreading the Christmas cheer, and, if we ever have a snow day again, this could provide hours of entertainment. Santa’s Christmas Village and Christmas Mishap: Santa’s Christmas Village by EnsenaSoft is actually 17 Christmas-themed games like Sudoku, Word Search, Solitaire, Minesweeper and more for $1.99. Seems to me it’s a great app to have ready for the long ride to grandma’s house. For those who like a little more originality and addiction potential, there’s the Christmas Mishap game where you control Santa’s sleigh and keep from losing his toys on his journey. It’s 99 cents. The Christmas List and Christmas!! : The Christmas List is an all-in-one app for shopping and tracking spending with email and address book integration. It’s $.99. I’m willing to give it a try, but I’ll probably go with the free Christmas!! first. this app has a calendar, countdown, gift list and more. It also has jokes and games and an Advent Calendar that can’t be unlocked until December 1. I have a feeling I’m at the tip of the holiday app iceberg. If you have favorites, email them to us and we’ll explore!